Polish AK47 AKMS under folder in 7.62x39 with a hand forged, chrome lined Polish Barrel. 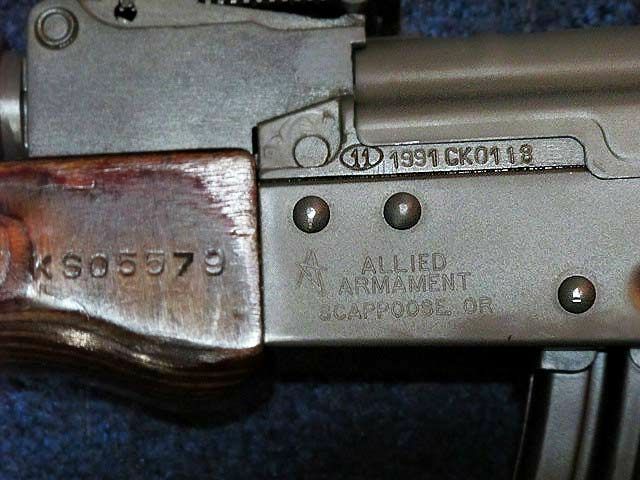 This AK47 was assembled from the highest quality, un-issued, numbers matching Polish parts sets. "11 in oval" marked front trunnion, with the original Polish, chrome lined, hammer forged barrels that are the key to the high reliability and durability that these guns are known for. Receiver is US made Nodak Spud Model NDS-1P. 922 parts include Tapco "no-slap" triggers and muzzle brakes. This unit was originally Allied Armament assembled. Includes hard case and FOUR 30 rd. magazines – 3 metal and 1 polymer. It also includes original cleaning kit and oiler. Also includes web sling not in photo. Polish AKMS AK-47's are the highest quality and most true to the original Russian design, with a higher level of build quality than the original Russian AK's. The US Marine Corps use the Polish AKMS in training indigenous troops in Iraq, Afghanistan, and the rest of their area of operations. This package also includes 25 individual boxes of 20 rounds each for a total of 500 rounds of Tulammo 124 grain FMJ. Price for all - Cash - $1350 FTF in middle Bucks County. Or, if you are only interested in the AK and no ammo, the price is $1050. I can process your credit card if you choose to use one as I have a small business. Interested in Remington 700's in upgraded models like SPS, Tactical, also Marlin 39A older model in excellent condition, Henry Golden Boy, and quality 1911's.